When coming from Delhi, take the ring road going towards Ajmer at Chandwaji just after the Toll gate (approx 50km). When coming Kota, take the ring road going towards Ajmer named Gopalpura bypass just after the Airport flyover (approx 20km). When coming from Sikar/Bikaner, take the ring road going towards Ajmer at the start of Vishwakarma industial area (approx 30km). When coming from within the City, ask for Sodala Cirlce/Ajmer Road, get there and then proceed outwards to Ajmer (approx 15km). 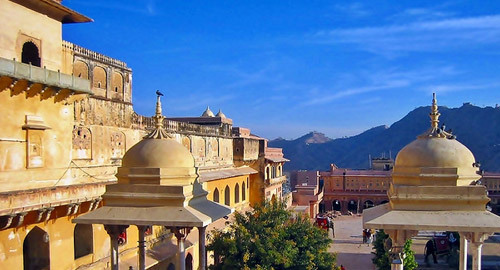 The Village is located just 20 minutes away from Jaipur on the Jaipur-Ajmer national highway No.8. The map shows the approach from all major nearby cities. If you wish to reach us via directly without entering the city. Kanchan Kesari Village ( so named after the owner's parents) is an ethnic theme based amusement complex where there is some thing for all age groups. The Village is located just 15 minutes away from Jaipur on the Jaipur - Ajmer national highway, set amidst 10 bighas of sprawling landscaped gardens. Looking for a short break from the hectic city life or wanting to relax after dawn on your long journey on the NH-8, the resort is the ideal choice for you. The pool facing rooms will soothe your frayed nerves. Splash around in the adjoining pool and take an occasional walk into the village area. Several activities are available to keep you engages during your stay. And you know what? There is no idiot box (T.V.) to intrude into your leisure.